There are many kinds of 'shacks'. What do you folks use for lighting at the operating position, and overall? I have a bunch of 'troffer' fluorescents hanging from the overhead, but my position's in the workshop area. I got an ad in my inbox from amazon, touting an 'arc lamp'. Cool! Turns out they have a bunch of arc lamps. It wasn't what was expected. The arc refers to the radiused mounting of the LED lamp. Tricked again! Guess it depends on the decor and atmosphere! My radios are in the workshop... The lighting in the shop is 2 tube flourescent fixtures. I have incandescent track lighting over the operating position..most times the flourescents are quiet enough but I turn them off and go to the track lites for serious operating. I am slowly replacing all my 4 ft flourescent fixtures with new 4ft LED fixtures...They seem to be radio quiet so far..
Pat..are you looking for a real arc lite for your shack? Mostly, I keep it the lighting at a low level. I use under-shelf LED light strips shielded behind corner trim so there's no glare - no direct view of the light source. For writing on paper, or close work, I have a small boom-type lamp with the translucent shade painted-over to prevent glare. For bright, general lighting, I use fluorescent lamps mounted high and out of my line of sight. As I sit here, I don't see any direct light shining into my eyes. A single bright source causes the pupils to close and makes everything else appear darker. Without glare, lighting can be kept at lower, more comfortable and relaxed level. all it needs is brandy in a snifter glass. I thought if you have enough Tube equipment with large enough Tubes.... you don't need lights? I could always use more tubes... and a cleaning lady. It may depend on the type. Some of them might not be too safe. I considered a HID lamp, the 175W or 400W 'industrial warehouse' type mounted 8 FT above the work bench. It would be only for when things can't be seen well. I thought, well maybe a 120V version of these things can be had cheap on amazon. Since then I found out about the explosion hazard and the special fixtures needed to contain them. This is a heavy fixture and it's not cheap at all. It's kind of impractical. An LED with similar output cost around the same it seems. Here is a photo of my operating position. All the lights are home brewed. The iron pipe on the ceiling was acquired from my local Ace Hardware. The hanging lights are cheapies from Ebay. The bulbs in the hanging lights are new (old-skool Edison with squirrel cage filaments). The spots are theatrical lights (also from Ebay...inky-dinks for you broadcast guys) to throw light on the mic collection. Those are all switched on at the shack entrance. 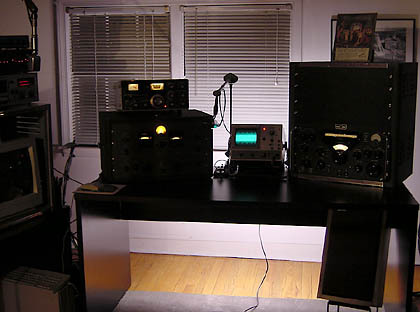 After installing all that I needed more light on the radios. I used strips of LEDs, powered by the power supply and switched by a spst on the panel strip that houses the Inovonics 223 above the K7DYY. No RFI. So I needed some kind of valence for those LED strips. I walked through Home Depot until I happened upon the perfect stuff: a 10' length of galvanized roofing rain drip edge (about $5 for 10'). The LED strips are glued to the upper part of the valence and the LED wiring goes to an Anderson power pole bus behind each cabinet. Patrolling the ionosphere from Dunedin, Florida. A previous station of mine. Not nearly as nice as yours. Here is a photo of my operating position. That is exceptional Frank! (or Bud? ) WO4K in any case. Steve I like the indirect lighting there. It's nicer than most! I could have my room if I'd get rid of my step brother hehe but that would be wrong. I’m in the process of installing some of the color programable LED light strips. Costco once sold the kit, but I’ve since discovered that they are about 70% cheaper buying them off EBAY direct from China. I like the idea of indirect lighting that can be further enhanced by changing the color and intensity from one convenient handheld IR remote. If you really want to go crazy, Bluetooth controllers are also available for just a few dollars. I already use LED track lighting for situations where I need lots of light. Again, the 100W equivalent LED bulbs are ~ $20 at Lowes and Home Depot, but only ~ $6 direct from China. Plenty of light, low power consumption and no RF noise! I tend to keep the lighting low when operating, and use my old student lamp with a low wattage bulb for desk highlighting. Though I'm in the process of setting up in a new location, I was previously considering adding 12VDC light strings under the bottom shelf for closer desktop lighting. This keeps nagging at me because the quality of such light is excellent even if they are high maintenance.. What do you have in that respect? My old ham elmer regaled me with stories of banks of 2-2000 Eimac rectifiers and 2000T Triodes that he could read by the light of. Not sure how much exaggeration was there, but he said the filaments were just enough, but the plates would run yellow hot he TX was keyed and really light things up. He always talked about that kind of stuff then later asked me why I wanted so much power.. I thought about low voltage incandescent lighting, 12V/28V, and so on -very dimmable and pleasing. A friend has hundreds and hundreds of lamps from 1000W stage lighting bulbs, to projector excitation types which give a warm low-key light and are almost free for asking. I think I'm done with incandescents for new work except where aesthetics or harsh environments demand it. So many special LED lamps now give the old-time light with 1/3 the watts, why not use them? For work-lighting in future, maybe when run out of the F40T12 fluorescent lamp stash for my troffers, LED direct wired 4 FT 'tubes' will likely go in. By then will be cheap too. "eventually" once I am rid of about 2/3 of my junkbox, the operating position should be able to be separate from the workbenches and parts storage and each space could have its own more attractive and appropriate lighting, in addition to those plastic 'curtains' to save on HVAC. The outbuilding itself has the basic comforts including a water heater, shower, toilet, and sink. I always admire how some folks have done a 'through the wall' installation where the faces of the large racks-sized transmitters are seen but there is room behind them for wiring, spares storage, and repairs. A nice commercial console would complete such a station - those folks usually have lots of space, like a whole garage.